If you’re a long-time pet owner, chances are you’ll have to deal with fleas at some point. You may even be unlucky enough to have fleas in the house from a friend’s visiting pet, or be unaware of the problem until the house is infested. Here are some thoughts on whether to attack the problem of flea control with a natural or more head-on solution. In general, it’s usually preferable to avoid using chemicals as much as possible in the home. This is especially true if you have pets or children, who tend to spend time rolling on the floor or putting things in their mouths. This is hard to avoid, so keeping your floors and other surfaces as chemical-free as possible is ideal. Unfortunately, fleas can be problematic because although the adults live on the fur of cats and dogs, they can latch onto humans and cause itchy bites. Their larvae also thrive on organic materials left on carpets, bedding and other soft furnishings, and the adults can live there for short periods too. First of all, vacuum the floors and other places you can, focusing on the soft areas. Try to be thorough, and then immediately empty the bag. Wrap it in a thick trash bag (or two) and put it in the external trash can. You may need to keep doing this for the next few days, as it’s difficult to catch all the fleas at once. Then, cover the carpet, sofa and pet bedding in diatomaceous earth. This is a natural product made from the fossils of sea creatures, and can be bought in many pet and health food stores. It works by cutting the fleas’ bodies as they pass through it, causing them to lose fluids and die. It’s important to wear protective breathing gear when using it, as although it’s natural, it can cause irritation if breathed in. Also be sure to quarantine the areas from pets and children while the earth is down, and don’t put it anywhere that needs to be frequently used. You can then vacuum it up, ideally after a few days. Spraying a solution of lemon juice diluted in water is another solution. This method may work better if you can’t keep adventurous pets and kids away while treating the area. Fleas hate the scent and may be deterred by it, so this is more of a preventative solution but can be good alongside other methods. Finally, wash whatever can be put in the machine on hot temperatures. Again, this may need to be repeated. Keeping clothes off the floor and washing at the same time as undertaking other treatments will avoid any fleas surviving. Also be sure to check and treat your pets themselves, applying medications and continuing to wear flea collars to get your cat or dog flea-free. Many pet stores and vets can advise on and sell simple medications such as drops to kill the fleas on them. If you’ve tried the above or just can’t bear the thought of fleas hanging around, you might consider the chemical options. It’s important to read any instructions and follow professional advice carefully. Some basic things to keep in mind are to keep everyone out of rooms being treated, often even vacating the entire house. Put food away, and be sure to thoroughly clean surfaces after treatment to get rid of any chemical residue. Pay particular attention to kitchen counters, and don’t neglect the floors and other areas that your pets and children spend time on. Self remedies like foggers, which disperse an airborne insecticide, or so-called “flea bombs”, may just do the trick. These are available in many pet stores and larger supermarkets. Some also promise to have a long-term preventative effect even after the pests are dead. Finally, you may need to consider getting professional help. 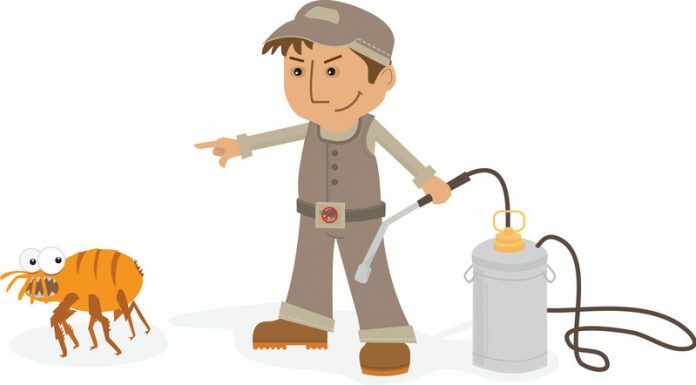 Exterminators may be able to deal with the problem with targeted chemical use or even fumigating the house in serious cases. They’ll be able to advise on safety and should be diligent in ensuring all residues are cleaned away. Do be sure to follow up with your own cleaning of food surfaces and other contact areas yourself. Flea control is no fun, but it’s necessary to take steps when you identify any problems. With regular cleaning, checking and prevention, you can help stop the problem occurring in the first place and halt flea infestations in their tracks. Consider gentler approaches at first and then look into more robust approaches if the problem persists. As always, your vet or pet store clerks will be excellent sources for more information.